Spectacular fireworks will illuminate the skies above Tower Hamlets on 4 November when residents can enjoy a stunning and free Fireworks Night display to keep the whole family entertained. 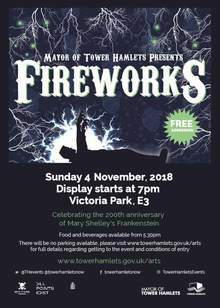 This glittering fireworks display will take place in Victoria Park at 7pm. •	If you are travelling from stations between Tower Hill and Bromley by Bow, use the rail replacement bus service (service A) directly to Mile End station. •	If you are travelling from Plaistow, Upton Park and East Ham, use the rail replacement bus service (service B) to Canning Town, then take the Jubilee line to Stratford, and then the Central line to Mile End station.